Ben Cox’s unbeaten 42 saw Worcestershire clinch a narrow three wicket victory over Northamptonshire at New Road, inflicting a first defeat of the competition on the Steelbacks. Tom Kohler-Cadmore hit 60 in the Rapids’ chase of 170, but when he fell, 24 were still required from 14 deliveries, but Cox hit a six and then the first two balls of the final over for four as Worcestershire got over the line with three balls to spare in fading light and rain in Worcester. 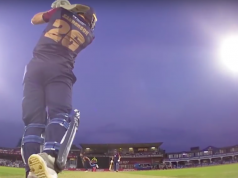 For Northants, Ben Duckett hit a maiden T20 half century, but the Steelbacks lost wickets regularly, and only a late cameo from Graeme White, who hit Jack Shantry for three consecutive sixes, took the Steelbacks to a competitive score. The victory saw Worcestershire gain revenge for defeat at Wantage Road seven days ago, and returns the Rapids to the top of the North group, although they have played a game more than Northants, whose record now reads three wins and one defeat as the Blast’s last remaining 100% went. On a cloudy evening, the run chase was played in steady light rain, with light deteriorating throughout the chase, but Cox kept his head, with six fours and a six in total, including an array of inventive shots, sweeping his maximum off the quick bowler, and a pair of reverse ramp shots, and Steve Rhodes paid credit to his keeper. “It was a tough match, Northants tested us but I thought the two lads there, Tom Kohler-Cadmore and Ben Cox played superbly,” he said. “That was a really exciting match, played in very poor conditions because of the drizzle. “Credit to all the players, including the Northants players for staying out there all game, obviously they wanted to as they were ahead of D/L, also the umpires had a tough call tonight. For the most part it looked like Kohler-Cadmore was marshalling the Rapids’ chase as they recovered from losing three wickets inside the first three overs, perhaps with too much of an eye on D/L par, Joe Leach, Joe Clark and Alex Kervezee all skied catches, Azharullah with two in his opening over. However Brett D’Oliveira steadied the innings with Kohler-Cadmore, although the former had a life when dropped on 16 by Azharullah at short fine leg; drop catches a theme of the evening after two off Duckett were almost costly for Worcestershire. Kohler-Cadmore completed his half-century off 33 balls, his first score of note since his century in the opening match of the competition. The stand of 69 in 44 took Worcestershire to 89-3 at the midway point, before D’Oliveira was brilliantly caught one-handed by Rob Keogh at mid-off. Ross Whitely soon followed, bowled by Prasanna and when the 17th from Azharullah went for just three runs, the equation had got back up to 30 off 18, which looked an uphill task when Kohler-Cadmore lifted Ben Sanderson to long-off, where Keogh again took a stunning catch on the rope, flicking the ball back inside to complete the catch. However Cox swept Steven Crook’s next ball for six to leave nine required from the final over, and a reverse sweep and pulled boundaries got Worcestershire to the line. 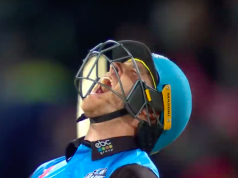 It could, and perhaps should, have been a more comfortable night for the Rapids as Duckett was dropped twice in making his maiden T20 half-century, the first, by Shantry at short third man, was notable particularly when the left hander had only six to his name. That would have left the Steelbacks four down inside the eighth over, Adam Rossington falling in the second for just two and whilst Josh Cobb hit two huge sixes, he also edged behind for 23. Northants captain Alex Wakely also fell for 20. Duckett survived his first life to sweep consecutive sixes off D’Oliveira, only to then get another chance as he drove George Rhodes to D’Oliveira at cover. Northants kept looking wickets however, Crook holing out to deep square leg for 13 before Prasanna was also caught on the boundary in the following over. Keogh hit four boundaries in a quick-fire 22, but when both he and Duckett fell within three balls off Leach in the 18th. Leach was the pick of the bowlers with 3-26, Northants looked to be falling short. However White clubbed 22 of Shantry’s penultimate over, including three consecutive sixes down the ground to lift the Steelbacks – a score head coach David Ripley believes was competitive until Cox’s late salvo turned the contest. “The D/L was a tight gauge, one minute we were ahead next they were, all of a sudden it was 30 off three and I thought we were ahead, obviously Rob Keogh’s catch looked like it might swing it our way. MOTM: Ben Cox’s 42 may not have been the highest score of the match, but it was the decisive innings that got Worcestershire over the line in a run chase that was threatening to get away from them. In addition to three catches behind the stumps, Cox showed all his innovation, his 24 ball knock was the difference.